It's a new beginning for the Warhammer 40,000 universe! Guy Haley crafts a tale of the returned Primarch Roboute Guilliman as he races to save his realm from the servants of Nurgle – it's the perfect accompaniment to the new Warhammer 40,000 game! Huh.....the Indomitus crusade already ending? Such typos in the blurb. It looks to be a setup for the upcomming Fate of Konor campaign. Placed an order for the Limited Edition... Hoping they have sorted their quality issues by now. Doubt it tho. Seems a century has passed since the gathering storm events. So we are solidly within M42. Traditionally, the Adeptus Custodes had taken orders only from their own officers and the Emperor. That was until Guiliman had been declared Imperial Regent; The Emperor's living voice. Last edited by Brother Lucian; 06-03-17 at 12:51 PM. Not bad. I still think if you're paying 55€ for a book they should throw in the ebook for free, but I guess it's a start. oh wow, Cawl is trying to pressure guiliman into launching Primaris marines of the traitor legion genelines to serve the imperium again. But also the 2nd and 11th legions, the lost legions. So far Gman is rejecting the idea. Snagged my limited copy. Even though the ebook isn't free, I'll definitely take a discount. Finished Dark Imperium. Absolutely top notch epic writting, Guy Haley delivers yet again. 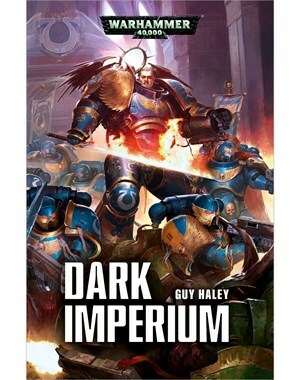 I think the novel settles a lot of the worries about the Primaris marines and Guiliman's own involvement with the Imperium as well his attempts at shoring up the failings. So many juicy revelations and suprises. Dark Imperium is set 112 years past the Gathering Storm events. I rate Dark Imperium as 10/10, a rare sublime classic. We are introduced to Captain Felix, whom was born soon after the Heresy. He was about to become an ultramarine, when he was snatched by Cawl's agents and ended spending millenia in stasis. We see the older marines tutoring their newer brethren with just a century of fighting experience. Cawl declaring the geneseed of the wolves and blood angels to be within acceptable parameters. And every chapter now have the full amount of organs thanks to the primaris reinforcements. We see the events of his death at the hands of Fulgrim. But also his memmory of a certain encounter that is gradually built up to the full reveal in its full and terrible glory. I think -that- will change a LOT of things. Gman also recovered Maccragge's Honour, the Gloriana class vessel is his flagship once again. Finally he is not bound to the Armor of Fate. Theres a long sequence of the serfs armoring him up from nothing. Last edited by Brother Lucian; 06-03-17 at 05:03 PM. Wow. I didn't expect this. Thanks for quick review. Very excited to get my hands on LE.